The Juneau Raptor Center (JRC) is a non-profit, volunteer organization that was founded in 1987. We have a dual mission: to provide treatment and rehabilitation for injured wild birds of Southeast Alaska and to provide education about wildlife to the public. 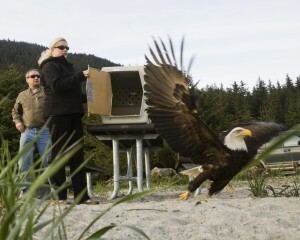 Kathy Benner and husband Tim Benner release a Bald Eagle at Eagle Beach on May 14, 2010, in Juneau, Alaska after having rehabilitated it at their home. The JRC is staffed by almost completely by volunteers. Even our board members are volunteers! The only paid positions are the naturalists that take care of the non-releasable eagle on the top of the tram in the summer and an office, secretarial position. All non-veterinary care (cleaning, feeding, dressing changes, ect.) are performed by volunteers. Membership and donations are used for food, veterinary services, medications, transportation, and other supplies for our work. Your contributions are greatly appreciated and tax deductible.